Editor’s note: Slavery is an integral part of the American story and those who were forced to come to the US in chains, are no less immigrants than any other group. Not only was their freedom taken, but in many cases, their personal family history was lost. On this web site of immigration stories, we pick up their descendants’ story starting wherever the family can trace it. 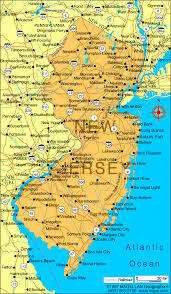 This is a map of New Jersey, where James Bobbitt is from. “I was sitting there looking at you when yo mama had you boy! You was solid lil kid there. Me and your cousin Mike was like ‘look at that sucka there!’ He was the one that gave yo mama the idea to name you Millian. But I knew ever since you was little, that you was a very special young man. Look at you now, all grown up on me and stuff man, shoot! When you was little it was entertaining to watch you jump all over the place and act a fool. I used to love throwin’ the football around to you every time your mom dropped you off with you and your granny.” These were the words that I told my grandson when he called me for an interview. I was born in 1955. The place we lived in New Jersey was more like a rural, kind of suburban area, but we were really close to New York, so it was fun going to a big city, and enjoying the culture, the entertainment, and the food. Well, being born in the late 50’s, I didn’t really experience the segregation for as long as my parents and older siblings did. I had one brother and two sisters. My parents always told me how they had way less opportunities growing up. They said that their families were often subject to racial tensions for being black during that time, how they couldn’t get as good of an education as all the white folks around them, and how they were seen as less even if they could do better than some white folks. My parents weren’t such a big part of the civil rights movement when I was little though. They would always say how ‘you can’t slip up around these white folks here or they’ll get ya,’ basically saying we had a disadvantage against white people around us and had to make sure we carried ourselves appropriately all the time. I was being raised in the middle of the civil rights movement, but didn’t really know what was happening until around my teen years. My most disturbing memory was being called a n***er by a store clerk when I was about 12 years old. But, around 1973, I had enrolled to go into the Navy, out in California. I had weighed all my options and figured that going to the Navy would be the most beneficial since I wasn’t really pulling in full rides to any colleges. Even until this day, I still go back into my benefits and find things that could be really good for me. My parents were a little worried, but they said “At least it’s not the military!”(laughs). So, the Navy flew me from New Jersey out to Alameda where my ship was docked. In that plane, I thought about how I was leaving everything behind. My friends that I have created very deep relationships with and the family that I deeply care for. But, I knew that this opportunity would be great for the life ahead of me. When I arrived in California, it was way different from New York and New Jersey. Areas like El Sobrante and Pinole were farmlands. It was hard to adjust to that, from living in a big city. The culture was way different, the sites weren’t as wowing, but it was very peaceful and leveled me. I was in the Navy for 6 years: 3 years off-duty and 3 years on-duty. While I was out in California, I met your grandmother in Pinole. She had our first child Tomeca in 1974, and then we got married in 1976. Then our second, Nicole, and about 5 years later, our last, Keisha. After I got out of the Navy, I started working from Loomis. We were coin handlers. After years of working there, until I was about in my late 50s, I had been let go and found myself a job working security for the Oracle Arena for the Golden State Warriors home games. They even gave me a duplicate ring from when they won the championship in 2015. It was fun occasionally talkin’ to the players. I thought I was a pretty solid at my height, but seeing them towering over me like that was surprising. But, soon after I just got too old and couldn’t really work like that anymore. Now I just live with my daughter, Nicole, and her dog. I get calls from family back home sometimes. My sister Donna is always askin about how my daughters and grandchildren are doing. I just tell her how much they’ve grown up and how proud of them I am. My greatest accomplishments are having my 3 daughter though. Throughout the years they have given me so much happiness and enjoyment. I’m also proud that through moving here, I was introduced to religion and the weather is way better out here than out in Jersey. I miss mostly everything that New York and New Jersey had to offer. Again, the food, culture, entertainment and all my friends and family. See if I hadn’t moved out here, I probably would’ve either went to trade school or finished my flight training. The story of James Bobbitt was written and recorded by his grandson, Million Jackson.